Royal Flamingo Villas is a private condominium operated as a vacation beach resort. Forty individual villas each offer a living area, dining area, kitchen, and private patio. A one bedroom, one bath villa will accommodate up to three guests. 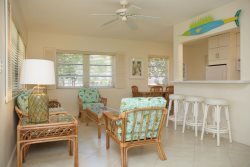 A two bedroom, two bath villa will accommodate up to six. FREE Internet and Parking! Rates quoted for 2 people (max 3 at additional charge) Approximately 600 sq ft. FREE Internet and Parking! Rates quoted for 4 people (max 6 at additional charge) Approximately 800 sq ft. FREE Internet and Parking!